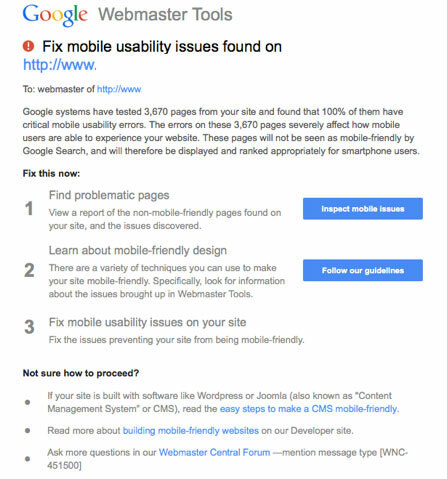 You’ll only receive one of these warnings if you or your website designer have set up Google Webmaster Tools for your website and it isn’t currently mobile-friendly. To make it easy for you to check, Google have produced an online tool where you can test your site. All you need to do is enter your URL on this page to find out. What can I do if my website isn’t mobile-friendly? First of all, don’t panic! Your websites position in the search engine rankings shouldn’t change for those searching on desktop computers and depending on your business type, the majority of your customers may still be using desktops. However, this is changing at a rapid pace and in some countries, over half of all searches are carried out on mobile devices. There are a number of things that can be done to make your website mobile-friendly. In some cases, the style sheets of your current website can be changed to create a responsive design which will resize the website depending on the type of device being used. In other cases it will mean rebuilding the entire site using a fully responsive design.